The dispute over large-scale trade agreements is often framed in exclusively distributional terms – especially by proponents of the deals. They portray the agreements as job and growth machines that are essential for safeguarding and enhancing the prosperity of participating states. Meanwhile, critics argue that such agreements would generate little economic growth whilst eroding social, environmental and health protections. Framing the debate in these terms may give the impression that the controversy can be solved with research and normative evaluations of the likely economic effects of the agreements. But this is wrong. The economic consequences of such trade deals must of course be evaluated thoroughly – including the effects on the least well-off outside the planned trade areas, which are often neglected. However, there exists a more fundamental procedural concern which is not addressed by the debate on distribution. Perhaps the greatest danger of the proposed trade deals is that they could structurally undermine democratic decision-making procedures. Opponents of TTIP, TPP and their siblings rightly object to the ever-increasing political influence of corporations on the structures of the global economy. These agreements are steps in a gradual process that, if left unchecked, could ultimately lead to a fundamentally undemocratic system of global governance. Trade agreements like TTIP could help usher in an age of “corporatocracy”, so named for the unprecedented political sway that multinational corporations will enjoy. How could corporatocracy come about, and it is a realistic fear? Let us consider two forms of problematic corporate influence in the context of trade agreements; influence on negotiations, and investor-state dispute settlement mechanisms. Multinational corporations have excessive influence in negotiations on international agreements, such as NAFTA, TPP, TTIP and CETA, while the general public and advocacy groups are largely excluded. This is unsurprising, given the susceptibility of our political decision-making processes to disproportionate influence by business interests. Consider for example lax campaign finance regulations and the infamous “revolving door”, the high ratio of lobbyists to bureaucrats in Brussels, and the experts who receive funding from corporate agents on both sides of the Atlantic, providing in return dubious research on the alleged positive effects of deregulation measures and trade agreements. Meanwhile, investor-state dispute settlement mechanisms (ISDSs) could allow TTIP, TPP and CETA to entrench and intensify corporate influence in the medium- to long-term. ISDSs provide investors with powerful juridical tools to either prevent regulatory measures that oppose their financial interests or to sue states that have taken such measures for loss of profits. These mechanisms are already in place in around 3000 relatively unknown bilateral and multilateral trade and investment agreements. ISDSs allowed Philip Morris to sue Uruguay and Australia for graphic health warnings on cigarette packages and Vattenfall to sue Germany for environmental legislation, to name only two of the more well-known investor-state disputes (many more have been kept secret). ISDS mechanisms tighten the already powerful grip of multinational corporations on political decision-making processes. The modified TTIP and CETA proposals now provide for more transparency in the form of public dispute settlement courts, but they still give foreign investors special rights to sue states if they see their business interests harmed by state regulations intended to raise social, health and environmental standards. These special rights are unnecessary because in the states that are party to these agreements, corporations can protect their legitimate interests using the well-functioning existing legal avenues. However, with TTIP and CETA in place, regulators would face a calamitous choice between paying high penalties for implementing standards that violate agreements, or pre-emptively avoiding the regulative measures in question. In this way, agreements that are binding in international law can permanently curtail the decision-making powers of democratically elected bodies. Opposition to this level of corporate influence does not presuppose a view that corporations and their agents are inherently evil or exclusively self-interested. Likewise, we need not deny that corporations should be consulted in the process of formulating legislation, given that their technical expertise is valuable for determining effective regulatory measures. But the question is not whether business representatives should be asked to share their expertise for realizing the common good. Rather we must ask whether we should consent to agreements that will give corporations even more power in our globalized economy. To avoid this move towards corporatocracy, we must reduce structural corporate influence on political decision-making to a prudent level, rather than increasing it. 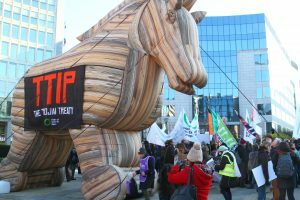 The growing resistance against TTIP, TPP and CETA is a hopeful sign – not only because it could ultimately prevent the implementation of these particular deals, but also because public discourse seems to have incorporated the insight that setting market rules is a genuinely political task that must be solved democratically. But the fight against excessive corporate influence in politics will not end with the circumvention (or radical reform) of trade deals like TTIP and CETA, since corporate agents can easily change the playing field and concentrate their energies on new and lesser-known projects. This challenge clearly transcends the area of trade politics, as the latest scandals of systemic tax evasion by wealthy individuals and numerous multinational corporations have shown. Opposition to TTIP and its sibling agreements must also not be conflated with opposition to a politically framed and socially just system of international trade in general. There is no reason why international trade could not be structured so that it simultaneously corresponds with demands of democratic governance, results in higher production and consumption standards, and supports greater economic prosperity for the least well-off. It is ultimately our responsibility to convert this theoretical possibility into reality.